and concede to his demand for Rajya Sabha berth in "immediate polls" to the Upper House.LJP will context six seats from Bihar in 2019 Lok Sabha polls while BJP and JD(U) will contest 17 seats each. 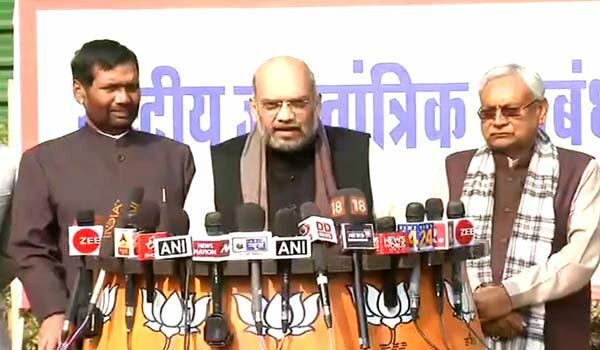 "Besides the seat share for the Lok Sabha polls, it has been decided that Mr Paswan will be accommodated in the Rajya Sabha as an NDA nominee in immediate polls to the Upper House," said BJP chief Amit Shah. Bihar Chief Minister Nitish Kumar addressing a press conference in presence of Mr Shah and LJP leaders Ram Vilas Paswan and Chirag also said that Mr Paswan will be accommodated in the Upper House "due to his seniority and long time contribution". Chances are that Mr Paswan, Union Food Minister, may get berth in the Upper House from Assam as Congress MP Santiuse Kujur's tenure ends on June 14, 2019 --- around the same time the process of Lok Sabha polls will be over. Mr Paswan, who is representing Hajipur parliamentary seat in Bihar for 10th term. In view of the present political situation in Assam vis-a-vis natives and 'outsiders' issue, the Assam BJP unit too could be reluctant to field 'a non resident of the state' as NDA nominee, sources said. Though, LJP put up a good show in 2014, in the 2015 Assembly elections, after contesting as many as 42 seats, it could win only two seats with a vote share of 4.8 per cent. This was a drop from 6.75 per cent in the previous assembly polls in 2010. Mr Paswan, known for being with the winning side in coalition politics since 1996, also predicted that"Agla jo chunae ayega, Narendra Modi ka sarkara banegi (In next parliamentary polls, it is the NDA regime which will come back to power yet again)". It is suggested that Mr Paswan and son Chirag could bargain in the favour of LJP ostensibly as the saffron party suffered defeats in three heartland states and also that RLSP chief of Upendra Kushwaha, which has support base among Kushwahas, has quit NDA and joined the opposition bandwagon. Mr Paswan is known for his hold among Dalit voters in the state and at this critical juncture where BJP's poll managers are seen losing control of things at times did not want to lose yet another ally. Mr Paswan has served as minister under Prime Minsters - Gowda, I K Gujral, Atal Bihari Vajpayee and Manmohan Singh - besides Manmohan Singh.He, had, however lost from his bastion Hajipur in 2009 and the LJP score in parliamentary polls was a stunning zero. LJP chief's son and Jamui MP Chirag Paswan had put pressure on BJP leadership lately even after six Lok Sabha seats were offered to his party. He also wrote a letter to Finance Minister Arun Jaitley questioning the wisdom of bringing in demonetisation in 2016 and reportedly kept channels open by talking to RJD leader Tejashwai Yadav. "By ensuring a Rajya Sabha nomination, Paswan wants to keep himself relevant in the national politics for the coming six years. His Hajipur seat may now go to his wife Reena or one of his brothers," a source said. "In today's decision all three parties have finalised the seat share for Bihar. We took all the decisions keeping the ground reality of Bihar in mind," BJP chief Mr Shah said. "All three parties are confident that in 2019, we will put up a better show than we had put up in 2014," he said. In 2014, JD(U) was not part of the NDA alliance and between BJP, LJP and RLSP of Mr Kushwaha - the NDA tally was 31. BJP had won 22, Paswan's LJP picked up 6 and Kushwaha's RLSP 3. Speaking after Mr Paswan, JD(U) chief and Bihar CM Nitish Kumar said, "Mr Shah spoke about 2014....in 2009, we were part of the NDA. Together we had won 32. I am sure we will out up better performance than 2009 too".Mr Shah said in the coming days more discussions will be held to decide on which seats who will contest. There are indications that even among sitting members of Lok Sabha between these parties, there may be some change of seats.Nitish Kumar's JD(U) may eye seats like Bhagalpur, which BJP's Shahnawaz Hussain lost to RJD and Buxar, which is at present being represented by Union MoS Ashwani Choubey. On Saturday, in a sudden move, BJP chief appointed Rajiv Pratap Rudy as party's national spokesman leading to speculation that Saran seat - now being held by Mr Rudy - may be parted away. Amit Shah also said a joint election campaign strategy will be worked out among the three partners for Bihar. "Chief Minister Nitish Kumar, Mr Paswan, Chirag Paswan and BJP deputy Chief Minister Sushil Kumar Modi will work out details on this," he said. Endorsing Mr Shah's views, Mr Kumar said individual seat level discussions too will happen cordially and final decision taken at the earliest. "I am happy and thankful to BJP that the party leadership has decided to show his due respect to Ram Vilas Paswanji," Bihar Chief Minister said.